physician’s clearance will be needed. TSF trainers will bring your physique and health to the next level by providing basic nutritional advice. Personalized nutrition programs will be provided that are easy to incorporate into the lifestyle of the client. strength training will make you look and feel younger. This type of anaerobic exercise uses explosive movements to develop muscular power, speed and agility. effective in building long lean muscle mass for male and females who want to lose weight. cross country, swimming, gymnastics, and golf players are only a few of the athletes TSF has worked with. body from hitting a plateau and continue improvement until the personal goal is met. 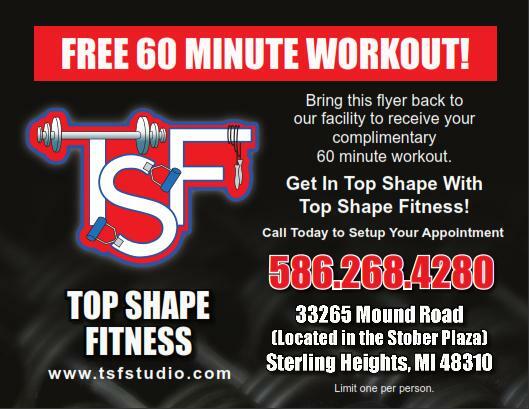 Call Top Shape Fitness, Inc. at (586) 268-4280 for more information on our senior fitness programs.